Posted by leskanturek in Bill/Invoice, Professional Practices. After the finish is handed in you are going to have to submit a bill to your client. Here is the basic information that I have on my bill. My 2-part bill. The white copy(left) goes to my client, and the yellow copy (right) stays in my records. One thing you should keep in mind when you are designing your bill/invoice. You are submitting it to an art director or designer who will then turn it in to the accounting department. Save the fancy illustrations and graphics for another time. This is the time to be clear and straight forward. along with any preliminary comps. All artwork will remain the property of the designer/illustrator unless purchased by payment of a separate fee. Authorship credit in the name of the designer/illustrator shall accompany the work upon its reproduction. First time North American reproduction rights are granted unless specified otherwise here. Any usage rights not exclusively transferred are reserved to the designer/illustrator, usage beyond that granted to the client herein shall require payment of a mutually agreed upon fee subject to all terms. Cancellation prior to the finished design/art being turned in and after preliminary sketches: 50% of the total fee. Cancellation due to the finished design/art being unsatisfactory: 75% of the total fee. 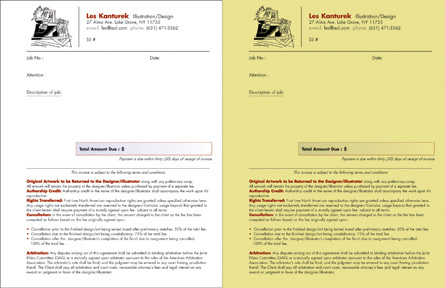 Cancellation after the designer/illustrator’s completion of the finish due to assignment being cancelled: 100% of the total fee. Any disputes arising out of this agreement shall be submitted to binding arbitration before the Joint Ethics Committee (GAG) or a mutually agreed upon arbitrator pursuant to the rules of the American Arbitration Association. The arbitrator’s rule shall be final, and the judgment may be entered in any court having Jurisdiction theof. The Client shall pay all arbitration and court costs, reasonable attorney’s fees and legal interest on any award or judgment in favor of the designer/illustrator.